I Am Ready for LASIK, but Can I Afford it? One of the top five questions every patient asks! The answer depends on what you have been doing for the last few years to “see”. If you answer “I wear contact lenses” then “YES” you most definitely can afford to have LASIK. Like most people, once you start to earn, you start to save for things you want to have in the near, or distant future. You might be saving for a new iPhone, a new pair of shoes, or perhaps more impactful, a pair of perfect eyes! We know that the cost of LASIK vision correction can vary from surgeon to surgeon – some surgeons price LASIK based off of your prescription while others may price LASIK by the technology used. But the vast majority of refractive surgeons have a set price for LASIK and each of their vision correction procedures. National surveys show that in 2016, the average cost of LASIK was around $2,000 per eye. The math definitely proves you can afford LASIK especially if you wear contact lenses. Better still, the $1,250 you have been paying annually for “X” number of years stops! And, since most contact lens purchasers are between the ages of 18 and 48, the dollars spent are enormous. Total the cost over 30 years – the number of years the average person would buy contact lenses. 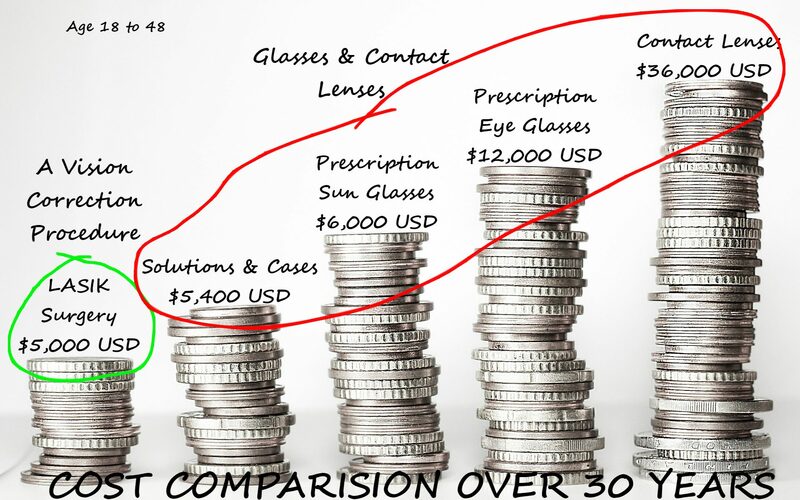 Now consider spending $5,000 for a LASIK procedure as compared to the more than $40,000 you will spend wearing contact lenses and glasses over the same 30-year period. So, one answer the question, “I am ready to have LASIK but can I afford it?” is Yes! Yes, you can afford it. Not only is LASIK affordable, LASIK has a proven safety record, is FDA approved, and remains the most commonly performed vision correction procedure performed worldwide. We know that most health insurers do not cover LASIK, let’s not let money on-hand come in between you and your perfect pair of eyes. Here are a few ways you can afford to have LASIK surgery beginning today or in just a few months. Financing through your Ophthalmologist’s Office – Today! Many ophthalmologists and LASIK eye centers offer their own financing through their office. This is when the “office” finances the patient procedure rather than a third-party, such as a credit card company, financing the surgery. The office will perform a credit check, and once approved, you will pay for your surgery on a monthly basis directly to the office. Financing through Third-Party Companies – Today! There are some amazing companies out there who provide healthcare financing options for patients – making procedures like LASIK affordable on the spot. ALPHAEON Credit and CareCredit are the most popular and offered at most physician offices. You apply while online, even while you are in the office. When you submit your online application, a credit check is instantly performed, and once approved, you will pick a payment plan that suits your budget. Payments are made monthly to the healthcare finance company. Not only will you be able to finance the surgery over low monthly payments, but you can simultaneously build credit as well. Of course, many people simply pay for their LASIK procedure using a major credit card, such as MasterCard, VISA or American Express. While others will use their line-of-credit or their credit union funds. Whichever third-party option you choose, make certain to pay the balance on-time to avoid finance charges or any changes in the initial financing rate provided if a payment is late or missed. Saving Up – Just a Few MonthsTime! If you are a planner, like me, then putting money away weekly into a savings account, or hiding it under your bed (whichever you prefer) will cover the cost of LASIK when you are ready really quickly! Here’s an idea – the $5 you spend on Starbucks every morning? Put it away in a “LASIK jar” instead. That’s $150 each month, or $1,800 each year! Add this to the $1,250 spent on glasses and contact lenses each year you will SAVE after you have the procedure done and you just “found” $3,050 each year to pay for your LASIK procedure! YES – you can afford to have LASIK! The true cost of a LASIK procedure? About $4,000 in 2016, makes this life-changing (for the better!) surgery affordable for practically everyone. If you think about it, the iPhone X makes a $1,000 hole in your pocket before the monthly calling plan is added – and you’re probably going to get the 11 or 12 in the next few years when it comes out, right? And certainly, if you wear contact lenses (and glasses when you can’t wear your contact lenses) then the economics of having a LASIK procedure is staggering! Your eyes? They will last you a lifetime. Your vision? You use it every waking minute!